Historically, ASUS has named their first smartphones back then according to screensize: the Zenfone 4, 5, and 6. 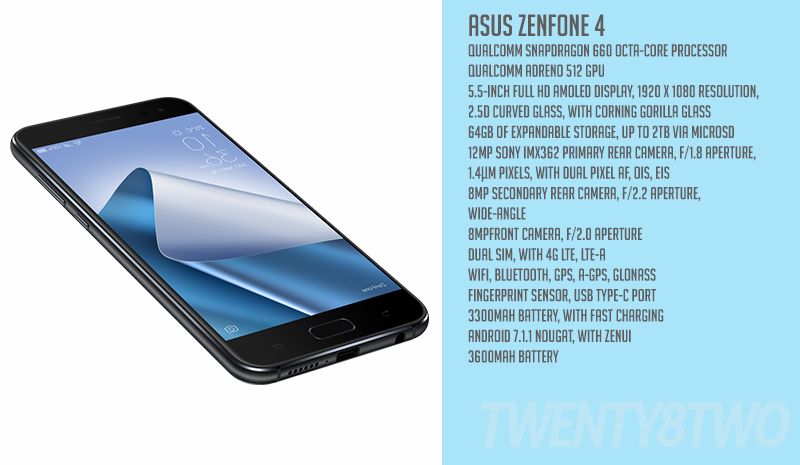 With the success of their venture into smartphones, ASUS has adopted the generational numbering for their phones starting with the Zenfone 2. Fast forward a few years later and here we are with the 4th generation Zenfones. As with previous generations, the latest from ASUS isn’t just one or two phones, but (locally), but five in total, and no Zenfone launch is complete without the flagship products. The Zenfone 4 and the Pro models both highlight mobile photography as its main selling point, capitalizing on the rise of budding photographers who want something lightweight to bring with them while traveling and still get great shots. That said, the emphasis lies in the handsets’ rear cameras. The Zenfone 4 features a dual rear camera setup: one is a 12MP lens with a Sony IMX 362 sensor with an F/1.8 aperture lens designed to take bright photos in low light conditions, while the other one is the 120 degree wide angle 8MP lens featured in all the other Zenfone 4 models. The device also has a Qualcomm Spectra 160 image signal processor for faster and smoother focus and zoom times, allowing you to capture moments better and with better color accuracy. A Snapdragon 660 octa-core is paired with an Adreno 512 graphics chip to make sure your games and media are all crisp and clear. The Zenfone 4 Pro is machined out of a single block of aluminum to make it tough but light on the pocket. The body houses a dual rear camera setup as well. The main lens is 12MP, f/1.7 aperture with ASUS Superpixel engine, PDAF, EIS, OIS, and RAW image support with 8x zoom coupled with a 16MP, f/2.4 secondary rear camera with 2X zoom to give you great photos and a total of 10x zoom capability. The Pro is also the world’s first smartphone to incorporate three Sony image sensors and the ASUS SuperPixel technology to give you great shots in low light. With a Snapdragon 835 processor, 6GB RAM, and an Adreno 540 GPU, the Pro is really at the top of its class, specs-wise. Both phones are powered with a 3,600mAh battery pack to ensure you can do everything you want during your day, and comes bundled with Android 7.1 Nougat and ZenUI 4. Marcel Campos, ASUS Global Marketing Head, has promised that the Zenfone 4 lineup will be upgradeable to Android 8.0, or Android O. The Zenfone 4 retails at P28,995 while the Zenfone 4 Pro sells for 39,995 at all ASUS retailers nationwide.